Ideal for days out, parties, sports trips or corporate events. Spacious interior combines stylish design and superior craftsmanship to create a more premium, car-like feel. The two rear-seating rows in the Tourneo Custom use a completely new and imaginative design which enables the seats to be easily folded into multiple configurations and removed in segments or completely. Each of the three-seat rows is configured as single and dual seat sections that can each fold separately, and are light enough to be easily removed. The folding mechanism allows the seat backs to fold flat, creating a work area or picnic tray, and then tumble forward completely, so they can be stored vertically, thus releasing extra floor space for luggage. In total, the two rear seat rows can be adjusted into over 30 different permutations, enabling the rear compartment to be configured for each journey to suit any combination of passengers and luggage. Customers are able to specific a recline feature for the rear seats and an armrest on the outer seats on the second row as options. All seating positions provide integral 3-point lap and shoulder style seat belts, with a driver's seat belt minder fitted as standard. ISOFix child seat attachment points are available on the two inner seats on the second row and the centre seat on the third row, with top tether mounts for extra security. 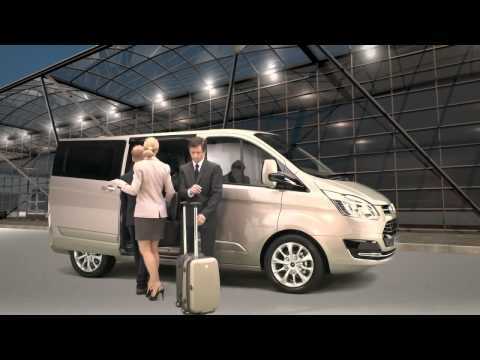 The flexible load-carrying ability of the Tourneo Custom is further enhanced by a unique new deployable roof rack system which is seamlessly integrated into the roof. Available as an option, the system features three transverse roof bars which are located in recesses in the roof panel, and which can be deployed when required. The roof rack system is capable of carrying substantial loads of up to 130kg, making it suitable for a wide variety of business or leisure equipment. When the roof rack is not in use, the cross bars can be quickly folded down, reducing drag and fuel consumption, creating a smarter appearance, and keeping the vehicle height under two metres for access through car park height restrictions. For flexible access to the rear compartment, Tourneo Custom models offer twin side sliding doors as standard, with running boards below the doors which provide improved low level step access. A hinged liftgate is fitted as standard at the rear. Within both the front and rear compartment, the Tourneo Custom brings a more premium, car-like appearance to the people-mover segment with an all-new interior constructed with high quality materials. The interior design is stylish and modern, adopting the more expressive design language found in Ford's latest kinetic design passenger cars. The front cabin has a car-like, driver-focused feel, with the characteristic sculpted shapes and bold graphics which are key elements of kinetic design. Features like the distinctive trapezoidal shapes of the instrument binnacle and the wing-like form of the instrument panel give the cockpit a unique and very contemporary appearance. In the rear compartment, passengers enjoy a spacious environment and a comfortable, fully-trimmed cabin, with carpeted floors and stylish flush-fitted trim panels which are similar to those typically found in a modern multi-seat car. Other passenger car features, like side window blinds integrated into the door trim, are available as an option. A choice of stylish, hard-wearing seat materials is available, with high-series models offering the option of full leather upholstery in an attractive medium stone colour, creating a highly luxurious ambience and enhancing the feeling of space and light. To complement the more stylish design, the interior was developed with a rigorous focus on quality and craftsmanship, to ensure that the cabin materials combined typical Tourneo durability and toughness with a more premium, car-like appearance. Throughout the cabin, the fit and finish of components has been significantly improved, with reduced tolerances and tighter radii. The choice and execution of materials follows the practices used on Ford's latest passenger cars, with distinctive accents used to highlight design details, yet offering good durability to withstand day-to-day usage. An example of the superior material quality is found in the instrument panel, which uses a specially developed synthetic material with a soft feel and a sophisticated grain pattern designed to match the leather used in Ford's car lines. This material combines low gloss levels, creating a perception of softness, with outstanding durability and resistance to marking.